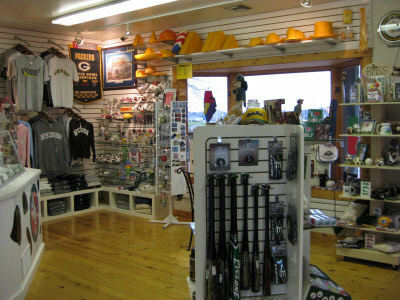 Prairieville Park has a large assortment of souvenirs and collectables for sale in our gift shop. Once you finish a game of mini golf or a round in the bumper cars, browse our selection of Wisconsin, Packers, Badgers, and Brewers merchandise. Along with Packer gear, we carry the original Cheesehead hat assortment. Wear a cheese top hat or fedora to mix up your Packer-themed style. We even have limited art prints for sale, the perfect gift for Wisconsin sports fans. Of course, we also have a wide selection of golf items to help you improve your game. Other souvenirs include postcards, shot glasses, spoons, magnets, and key chains. If you are hosting a birthday party, our toy items are perfect for goodie bags for your guests. Gift cards are available for purchase in any dollar amount for use at Prairieville Park. Give them to your family, friends, or children so they can enjoy mini golf, bumper cars, batting cages, or our gift shop. Contact Prairieville Park for pricing information on these limited edition items!